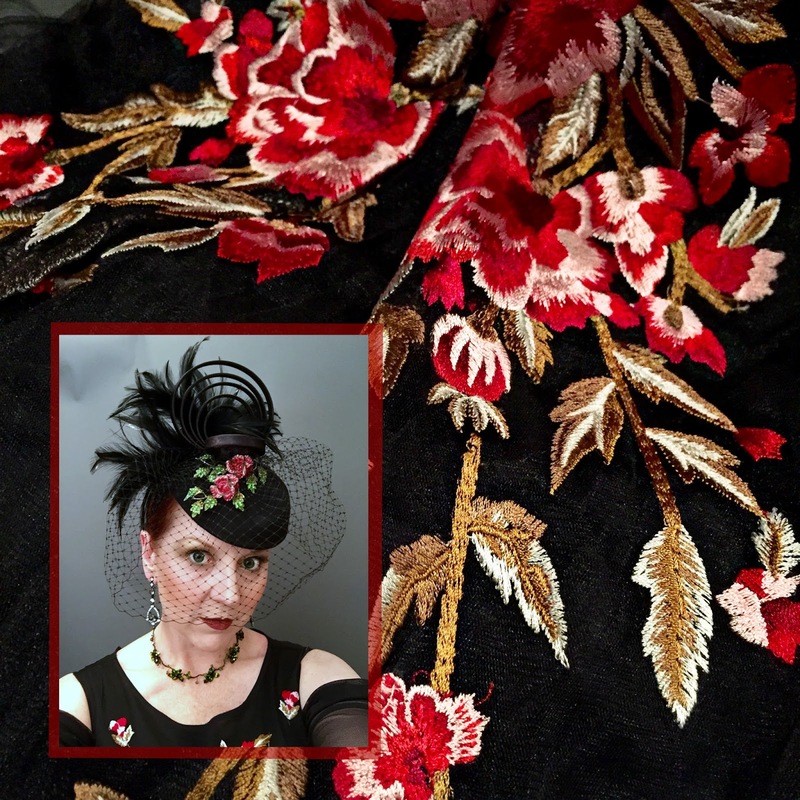 The last time I wore this gown from Victorian Trading Company (currently on sale! 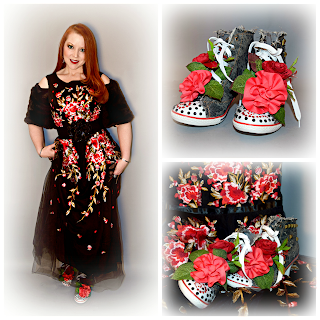 ), I paired it with tennis shoes, believe it or not - albeit tennis shoes a la Red's Shoe Diaries. See that look here. 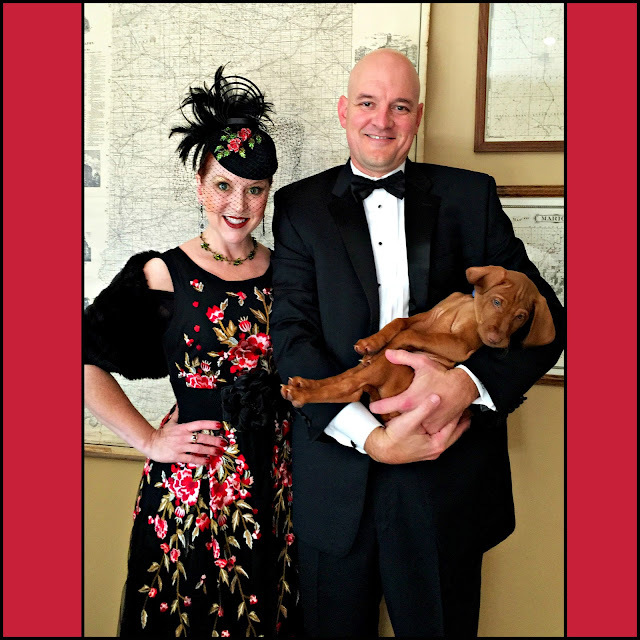 If you're a regular Red's Shoe Diaries reader, you may have noticed my posts have been a bit slower lately...There's a good reason for that: a four-legged, redheaded, velvety, wriggly bundle of puppy joy. 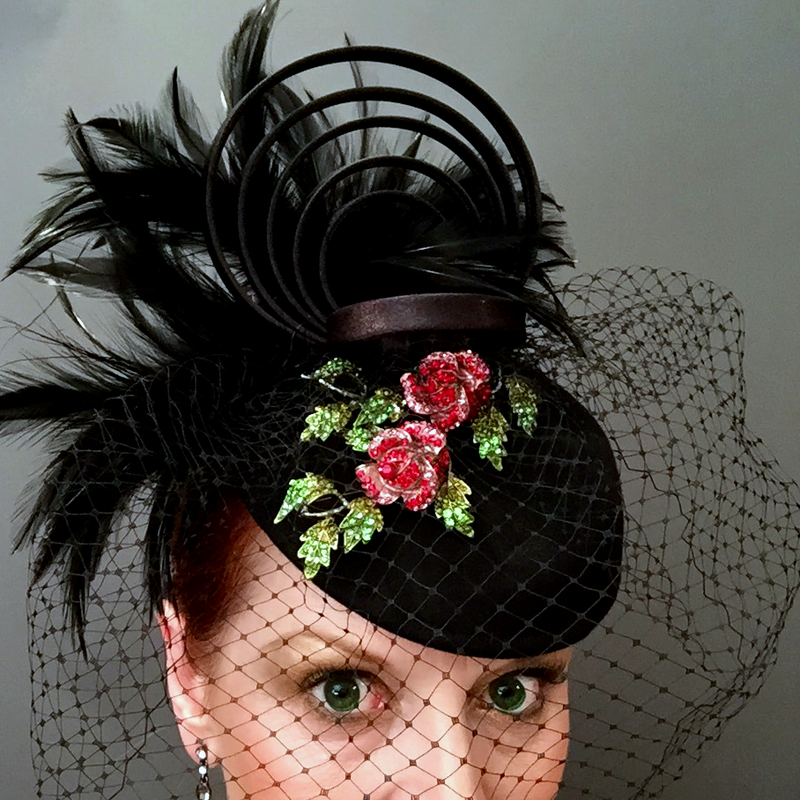 The intricate floral embroidery is everything, and I was thrilled to find a complementary crystal brooch to adorn my cocktail hat. Not that I'm complaining - that wrinkly little green-eyed ginger face is already a source of pure joy and unconditional love. Tim Riggins is a big cuddler, and when he's not chasing everything in sight, he loves to be held and follows me everywhere. 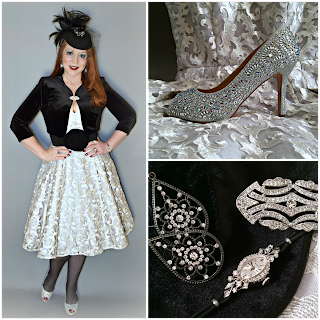 Both the hat and crystal brooch were inexpensive Amazon finds. I've worn the hat several times, but make it "new" with different accents. See it styled differently here. Tim Riggins is also still learning his manners, including what things are and are not okay to chase and chomp on. 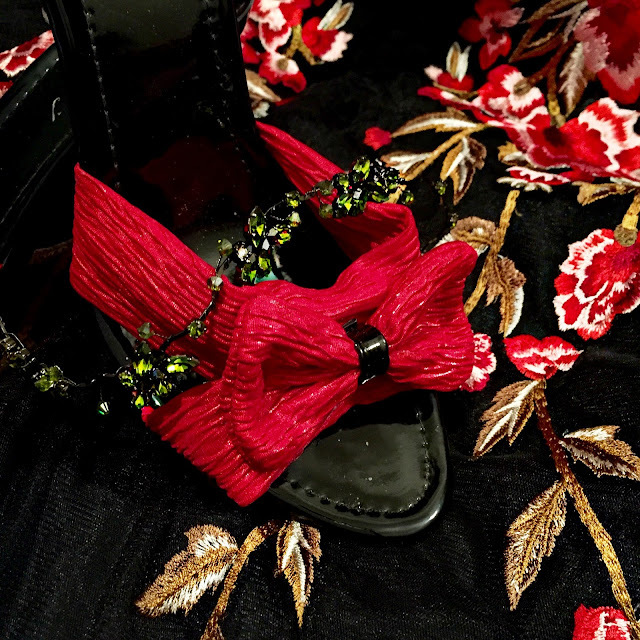 As you might imagine, he was completely befuddled Saturday night when I not only wouldn't pick him up, but scolded him for chasing after the 10 yards of embroidered tulle swishing around me as I got ready for the Indianapolis Symphony Orchestra's Opening Night Gala. 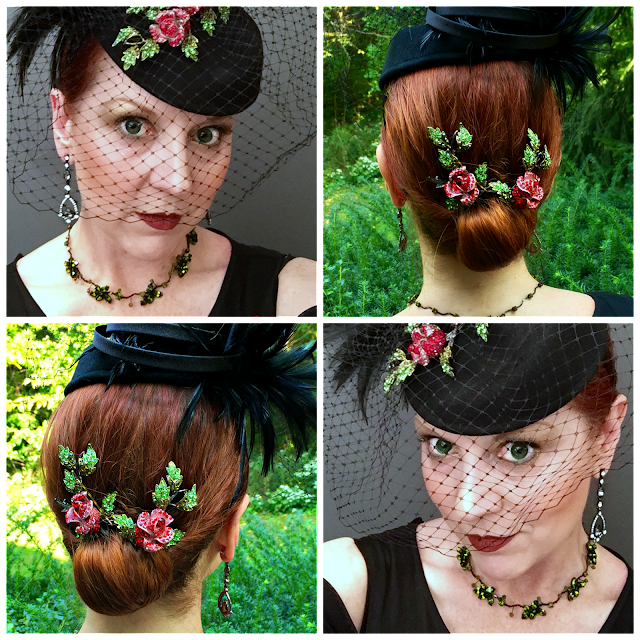 A second, matching, crystal brooch does double duty as a barrette. Tim Riggins may have his "momma's" coloring, but Tim Riggins does not do black tie. To him, a flowy dress and birdcage veil are obviously meant as an invitation to wrestle and play. Why on Earth would I not want to play tug of war with all that fabric?! Needless to say, he was much happier when I came home, put on pajamas, and rolled around on the floor with him. The green crystal"vine" choker has been in my closet for years. The dress didn't really need it, but I was feeling extra "sparkly" this weekend. But, Tim Riggins will learn. He's a smart one, that Tim Riggins. And as much as I enjoy every second with him (even when I'd rather he chase his tail than my tulle), I also love events like the Symphony Gala that showcase the incredible talent in our city and spotlight performances from superstars like Angela Brown and George Takei (both of whom wowed this weekend). It's all about balance. Oh wow, I am in love with your whole look, including Tim Riggins. We have six pups, so I think you know how I feel about those fur babies. I want the hat!!!!!! Your ensemble is fantastic from head to toe! 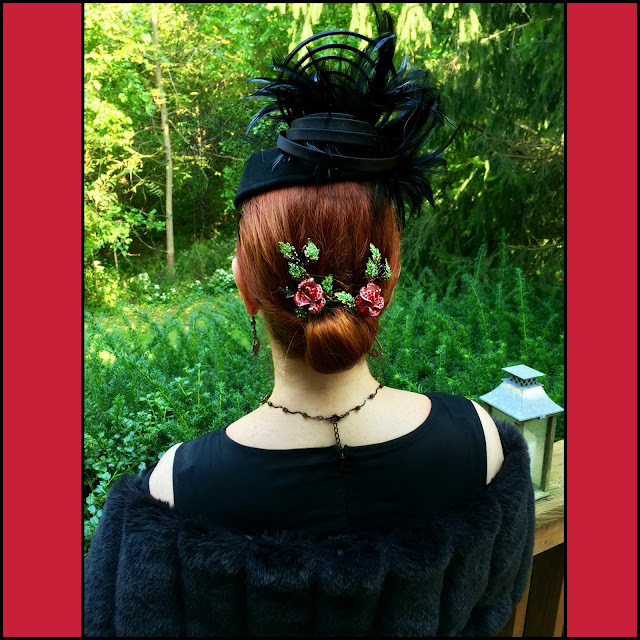 The cocktail hat is darling but the addition of the brooch on the front and using the matching brooch in back as a hair clip really ties everything together. Tim Riggins is adorable. 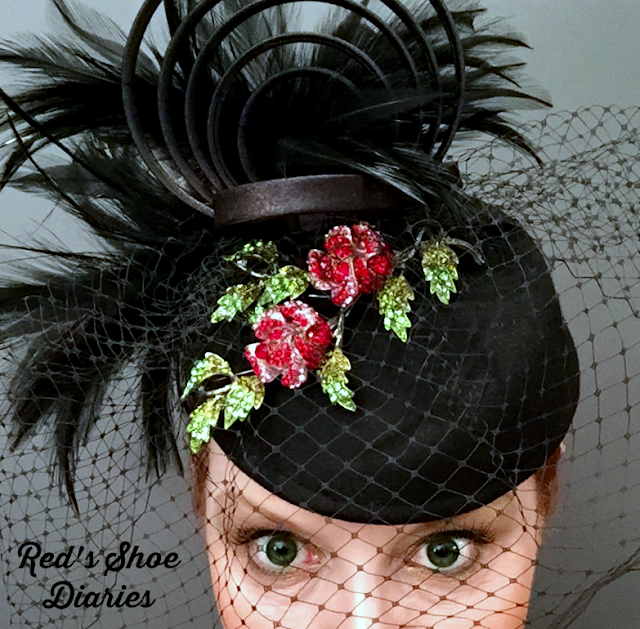 Thanks for sharing with Hat Attack! !